Visible along the wall in the background are three punches and thirty readers that form the paper-tape storage, with a large roll of tape above each punch. 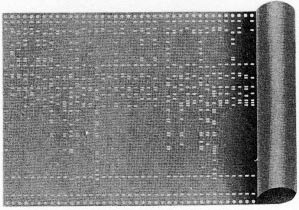 The paper tape was actually uncut IBM card stock, more than seven inches wide, weighing 400 pounds per roll [57, 59] (CLOSEUP). 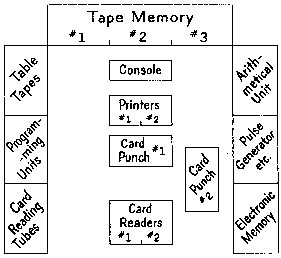 Along the left wall are banks of vacuum tube circuits for card reading and sequence control and 36 paper tape readers comprising the table-lookup section, many of them loaded with custom tape loops for commonly referenced data. Most of the panels along the right wall are occupied by the electronic arithmetic unit and storage. In the center of the room: card readers, card punches, printers, and (not visible) the operator's console. 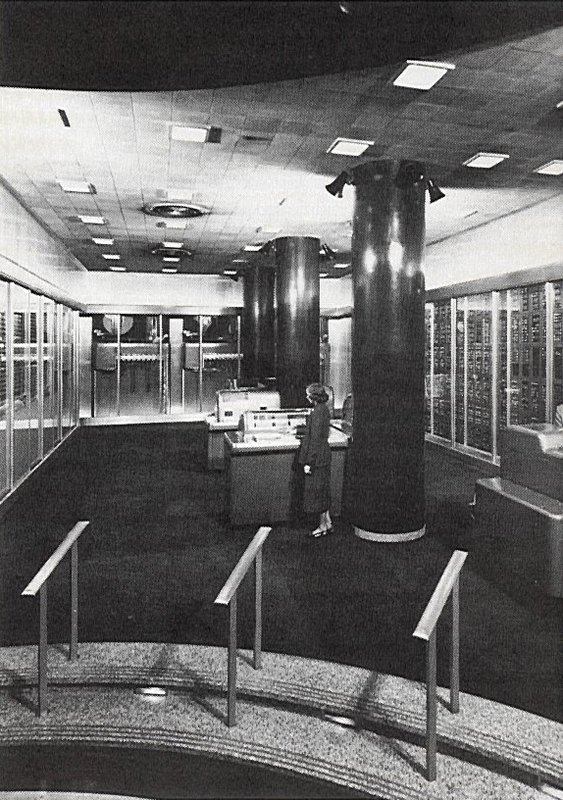 "Designed, built, and placed in operation in only two years, the SSEC contained 21,400 relays and 12,500 vacuum tubes. It could operate indefinitely under control of its modifiable program. On the average, it performed 14-by-14 decimal multiplication in one-fiftieth of a second, division in one-thirtieth of a second, and addition or subtraction on ninteen-digit numbers in one-thirty-five-hundredth of second... For more than four years, the SSEC fulfilled the wish Watson had expressed at its dedication: that it would serve humanity by solving important problems of science. It enabled Wallace Eckert to publish a lunar ephemeris ... of greater accuracy than previously available... the source of data used in man's first landing on the moon" . "For each position of the moon, the operations required for calculating and checking results totaled 11,000 additions and subtractions, 9,000 multiplications, and 2,000 table look-ups. Each equation to be solved required the evaluation of about 1,600 terms — altogether an impressive amount of arithmetic which the SSEC could polish off in seven minutes for the benefit of the spectators" . Control is accom­plished by means of written instructions, which the machine reads and follows. Typical commands are • "Read a number from one of the reading units and store it in a given memory unit"; • "Take the number from a given memory unit, multiply it by the one in another unit, drop a specified number of digits from the answer, and deposit it in a third unit." . 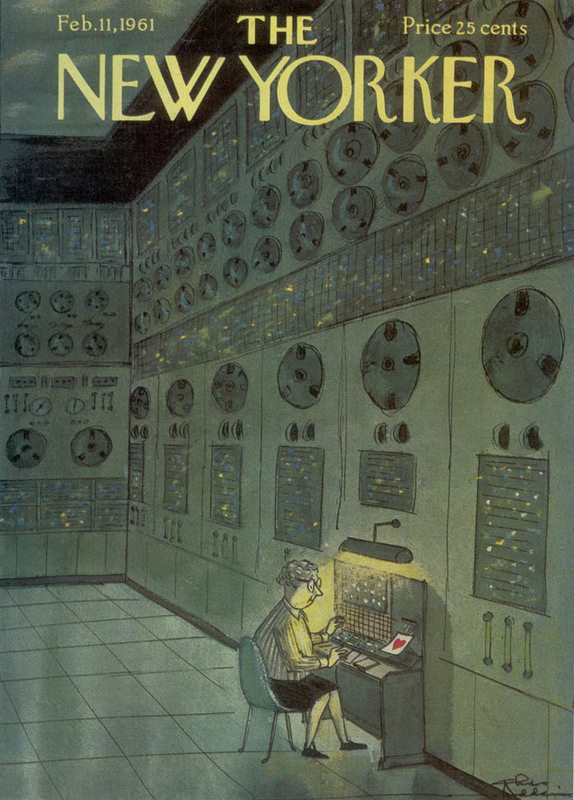 The SSEC was visible to pedes­trians on the sidewalk, and inspired a generation of car­toon­ists to portray the computer as a series of wall-sized panels covered with lights, meters, dials, switches, and spinning rolls of tape (click image to enlarge). 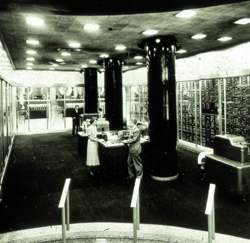 The SSEC ran at this location from January 1948 to July 1952, when it was replaced by the first-off-the-line 701, IBM's first "mass"-produced computer (i.e. more than one). 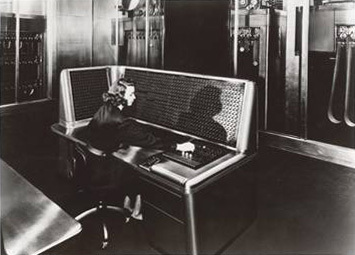 At the SSEC opening ceremony, 27 January 1948, Betsy Stewart  at the SSEC operator console. 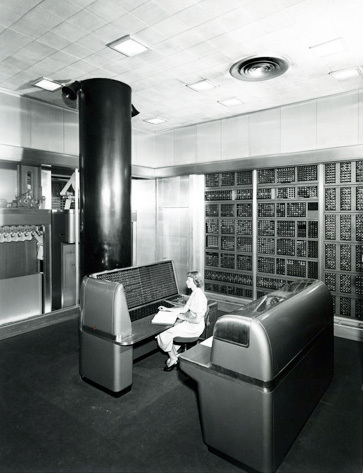 From left, standing behind the console: Robert R. "Rex" Seeber (SSEC chief architect) Columbia professor Wallace J. Eckert (project director), Thomas J. Watson (IBM president), and Frank E. Hamilton (chief engineer) . "[Above is] the famous retouched photo of [the SSEC room]: Bill McClelland at the table-lookup unit [left], Betsy Stewart at the console, an engineer on the right. NO columns" . CLICK HERE for an unretouched view. Watson Senior, upon first viewing SSEC prior to the public unveiling: "There is just one thing," he said somewhat off-handedly. "The sweep of this room is hindered by those large black columns down the center. Have them removed before the ceremony." But since they supported the building, the columns stayed. Instead, the photo in the brochure handed out at the ceremony was carefully retouched to remove all traces of the offending columns . 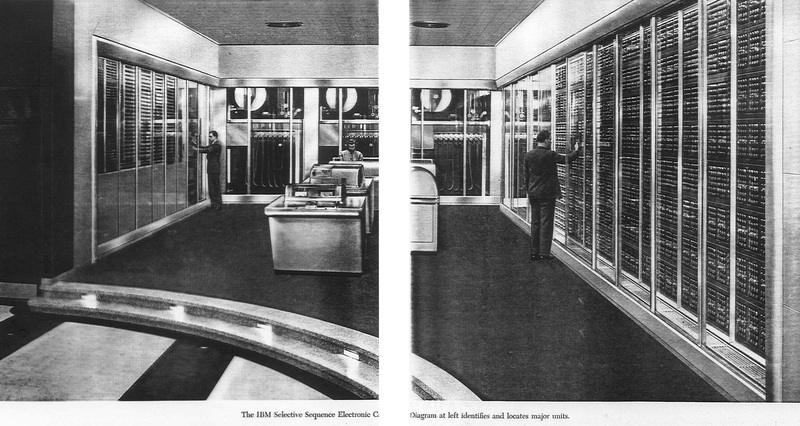 During that spring , Backus visited the IBM Computer Center on Madison Avenue, where he toured the Selective Sequence Electronic Calculator (SSEC), one of IBM's early electronic computers. While on the tour, Backus mentioned to the guide that he was looking for a job. She encouraged him to talk to the director of the project, and he was hired to work on the SSEC. The SSEC was not a computer in the modern sense. It had no memory for software storage, and programs had to be entered on punched paper tape. It had thousands of electromechanical parts, making it unreliable and slow as well. Part of Backus's job was to attend the machine, and fix it when it would stop running. Programming the SSEC was also a challenge, as there was no set way of doing it. Backus spent three years working on the SSEC, during which time he invented a program called Speedcoding. The program was the first to include a scaling factor, which allowed both large and small numbers to be easily stored and manipulated. Astronomy 111 — Machine methods of scientific calculation, I. 2 to 4 points Winter Session. Dr. ECKERT and assistants. Laboratory hours to be arranged. Announcement, or an equivalent. Permission of instructor required. Astronomy 112 — Machine methods of scientific calculation, II. 2 to 4 points Spring Session. Mr. SEEBER. organization of the machine and the preparation of problems for it. 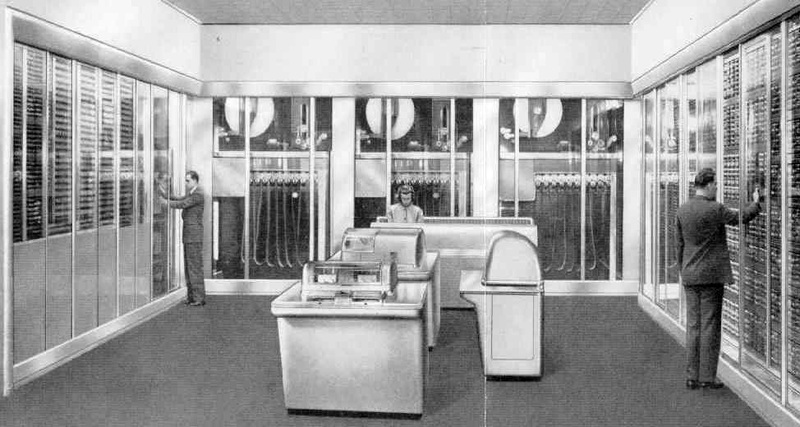 The following photos are from a November 1952 article in Chemical Engineering describing L.H. Thomas's solution, on the SSEC, of the then-64-year-old problem of the stability of plane Poiseuille flow, based on an analytical solution to the problem suggested by John von Neumann, and programmed by Phyllis K. Brown and Donald A. Quarles, Jr., of Watson Lab. The calculation took 150 hours, compared to the 100 years that would have been needed for hand computation. Pictured: Don Quarles (seated), L.H. Thomas (hovering), Phyllis Brown (seated). Was the SSEC the First Stored-Program Computer? 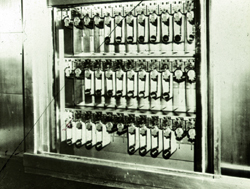 The Selective Sequence Electronic Calculator (SSEC) was the first machine to combine electronic computation with a stored program, and the first machine capable of operating on its own instructions as data. When placed in operation in 1948, and for some time thereafter, it was the most flexible and powerful computer in existence. IBM published relatively little about it, and the SSEC has been largely overlooked by computer historians. This paper provides a historical setting for the SSEC. McPherson, John, "A Large-Scale, General-Purpose Electronic Digital Calculator--the SSEC" (1948), IEEE Annals of the History of Computing , Vol.4 No.4 (Oct 1984), pp.313-326. Bashe , Pugh , and Brennan . Bashe, C.J., "The SSEC in Historical Perspective", IEEE Annals of the History of Computing , Vol.4 No.4, pp.296-312 (1982) (ABSTRACT). 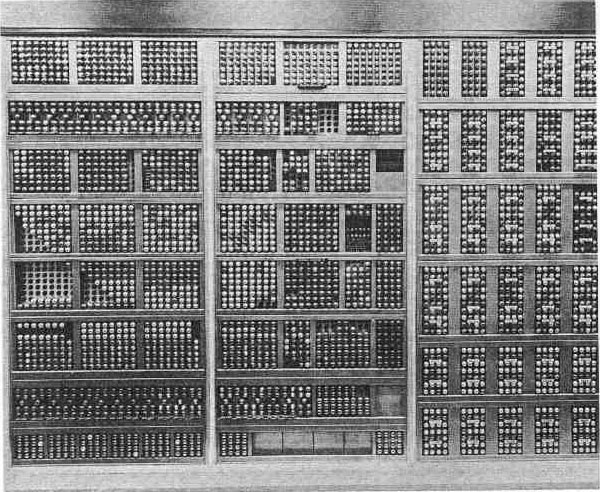 The IBM Selective Sequence Calculator , IBM Form 52-3927-0, New York (1948), 16pp. Grosch, Herbert R.J., Computer: Bit Slices from a Life , Third Millenium Books, Novato CA (1991) . Eckert, W.J., "Electrons and Computation", The Scientific Monthly , Vol. LXVII, No. 5 (Nov 1948). Polachek, Harry, "Computation of Shock Wave Refraction on the Selective Sequence Electronic Calculator", Proceedings, Scientific Computation Forum , IBM, New York (1948), pp.107-122. Anderson, Dan, "Mathematics in Electronic Age - IBM's Lightning Calculator Will Do Everything Except Percolate Coffee", New York Sun , Wendesday, January 28, 1948. Jones, Allan, "Five 1951 BBC Broadcasts on Automatic Calculating Machines", IEEE Annals of the History of Computing , Vol.26 No.2, pp.3-15 (2004). Jones, Steven E, Roberto Busa, S.J., and the Emergence of Humanities Computing: The Priest and the Punched Card, Routledge (2016). Includes chapter on the SSEC. SSEC Reunion 1972 (raw material). The IBM 701 that replaced the SSEC at IBM World HQ. Walk East On Beacon (1952), a Hollywood noir film featuring about a minute of footage of the SSEC. Olley, Allan, The SSEC First Electronic Machine on the Silver Screen, IT History Society, 1 January 2015. Screen shots of the SSEC from Walk East on Beacon at Starring the Computer. SSEC video clip from Walk East on Beacon (1 minute, 26 seconds). Gil Press, "This Day In Data: From the Apple Macintosh To The iPhone and AI in China", Forbes Magazine, 22 January 2019. "Columbia was a hotbed for computing technology. 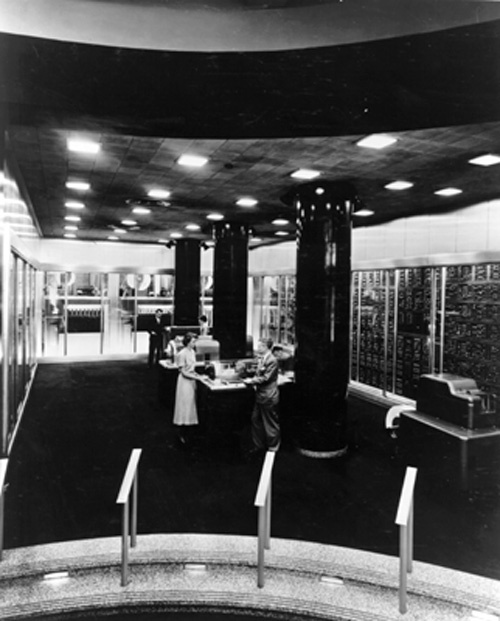 It boasted some of the first computing laboratories in the U.S., and in 1945 became home to the IBM Watson Scientific Laboratory led by astronomer W. J. Eckert. The Watson lab had first served as a computing center for the Allies in the final months of WWII. After the war, it became a site for developing some of the first super computers, including the Selective Sequence Electronic Calculator (SSEC), which Eckert later used to calculate lunar orbits for the Apollo missions. With this technology at her fingertips, Dayhoff combined her interest in chemistry with computing by way of punched-card machines — essentially early digital computers. 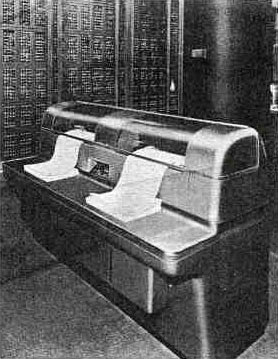 The machines allowed Dayhoff to automate her calculations, storing an algorithm on one set of cards and data on another. Using the machine, she was able to process calculations far more quickly and accurately than by hand."